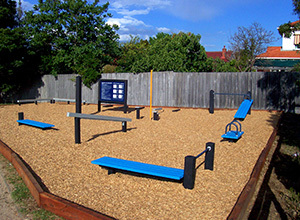 The Junior School Exersite™ is a modified version of the Exersite™, specifically designed for primary school aged children to provide a safe, effective and enjoyable exercise experience. 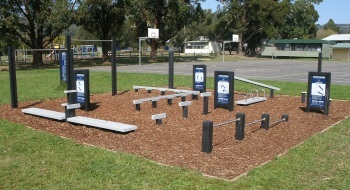 A cluster of 12 exercise stations, with corresponding recycled-plastic signs, sit within a 12 x 12 metre square. The exercises include warm-up and cool-down stretches, as well as arm, shoulder, tummy and leg exercises, heart and lung checks and agility and balance activities. 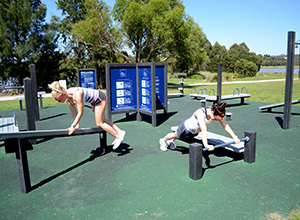 This balanced combination provides three levels to challenge children of all fitness levels. TEACHERS can make use of the Junior School Exersite™ for supervised PE classes. STUDENTS can use the Junior School Exersite™ following the easy to read instructions on the graphic panels. Students can work out their own fitness level and be challenged as they become fitter by moving to higher levels of activity. 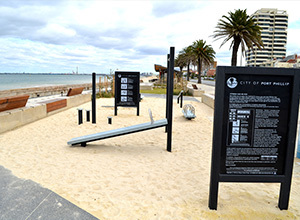 The exercise equipment and signage are made from durable recycled-plastic, which will not rot, crack, splinter, or need painting. The life expectancy under normal use is in excess of 40 years. 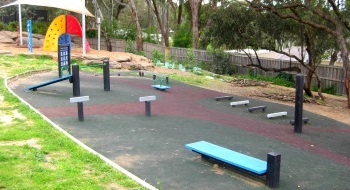 Compliant with Australian Standard: AS 4685:2004* – Playground equipment. Note: to comply, the installation plans need to be followed as these contain the fall zones and the level of undersurface.